Our customers are assured of having a reliable vehicle. More than 127 years of experience building coaches that operate on five continents in diverse climates and road conditions is our guarantee. Our coaches are designed under the most stringent quality parameters, with robust and reliable finishes of the highest quality. 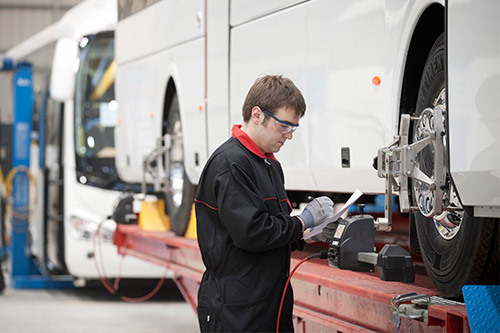 In addition to using the most advanced technologies for design, materials, components and production processes, before entering the market or making significant changes our buses and coaches are submitted to the most rigorous reliability tests in one of the most prestigious applied research institutions in the world, with excellent results. An accelerated fatigue track is used to simulate the accumulation of kilometers equivalent to the entire service life of the vehicle. The tests combine driving on different surfaces at different speeds. A series of maneuvers are carried out to stress the structure of the vehicle and to force the suspension systems, detect noises inside the compartment, visualize the intrusion of dust inside the compartments and even analyze wear. We simulate the intensive use of the coach to check its durability under the most severe conditions. The tests are extensively monitored. On a daily basis and for every certain percentage of tests, technicians from independent institutions inspect the coaches to detect any anomalies due to accelerated fatigue. 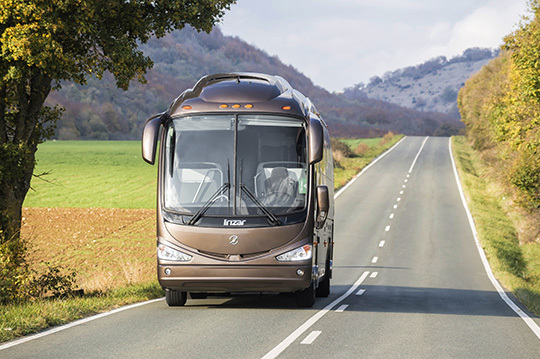 The technologies created by Irizar are aimed at overcoming challenges raised by traffic conditions and the terrain and nature of modern roads. They are also aimed at creating a sense of well-being and safety that is reflected in the pleasure and enjoyment of travelling. In regards to the former, especially notable are the full LED interior and exterior lighting, the multiplexed architecture and CAN communications protocol that articulates all the coach’s electronic systems and enables the diagnosis and data gathering services using the OBD connector that makes the systems somewhat “smart”. Also notable are the AEB-LDW driving assistance systems integrated via the touch screen, control and HMI console where the comfort and entertainment systems can be administered from. In regards to the latter, which reference passenger satisfaction, there are individual touch switches on the diffuser fixture. As a new feature, air circulation systems have been placed in the roof and under the coach that increase performance of the climate control and anti-misting systems, respectively. At Irizar, we are aware that fuel is the greatest cost operators must face, for that reason we have put all our efforts into reducing consumption. The new generation of Euro VI DAF engines with less internal friction, a modified fuel injection system, and other solutions, reduces consumption significantly. The software of the automatic gearboxes, the aerodynamics of the coaches with lower friction coefficients, the narrower front with smaller air intakes, the spare wheel cowling, lower weight due to the use of high-tensile steel and alloy wheels all actively contribute to making Irizar coaches leaders in their segment in terms of fuel consumption. Another factor that affects maximum profitability are repair and maintenance costs. Along these lines, service intervals have grown longer and a coach can now be driven for up to 100,000 kilometers before changing the oil and prices for powertrain and bodywork spares have been reduced. We can use the most advanced technology in our coaches to enable exhaustive monitoring and cost and efficiency control that helps transport companies optimize the performance and profitability of every fleet. On top of that, if you take into account that our service network continues to expand to provide Irizar authorized shops close to where coaches are operated and that the residual value of an Irizar coach is high, which makes the return on investment attractive for customers and that one of our priorities is to minimize CO2 emissions, it becomes very clear that choosing an Irizar is by far the best decision. Close and personal customer service is a value that identifies Irizar and sets it apart from the rest. It begins the moment you start making decisions about specifications and configuring your coach the way that suits your needs. The team of people that serves you will stay with you for the entire life of the vehicle, helping you make the best decisions to turn your purchase into profit. Our customers have access to a vast service network (1100 official service points on 5 continents, more than 700 service points in Europe), that includes full repair, tune-up and maintenance services with a full guarantee, 24 hours as day and 365 days a year. 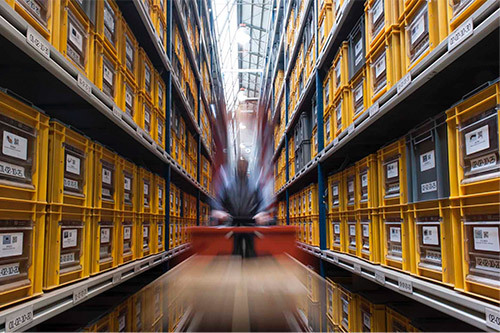 We also have modern technical and logistical centers for handling spare parts orders and supplying the required parts to any location around the world with very short delivery times. 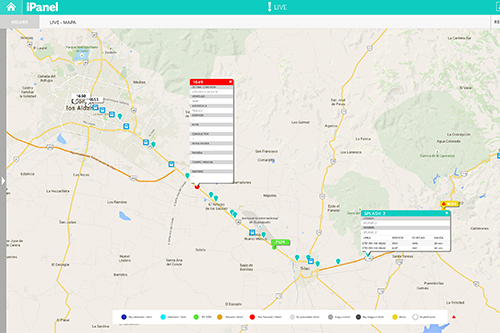 The iservice tool is a web platform for vehicle service management (usage, maintenance and repair) that provides comfortable access online or via mobile app or tablet to technical documentation for your coach, including the service manual, the shop manual or pneumatic and electrical information in addition to information about the service network to facilitate vehicle repairs. You can also use it to view the spare parts catalogues for individual vehicles graphically, visually and in detail by families and components and even manage orders, tracking and delivery of spare parts through the Eshop. The diagnostics tool is valid for all conventional Irizar vehicles, regardless of whether it is a complete coach or on a chassis. It can diagnose several systems including the engine, transmission, retarder, brakes, suspension, tires, fan drive cooling, pre-heater, third axle orientation, doors, elevators, lighting, climate control and more. 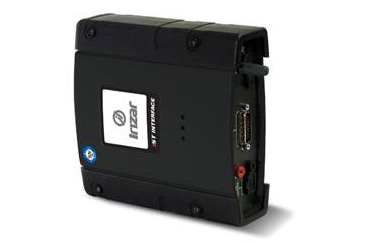 The connection between the vehicle and the diagnostics tool is made via Bluetooth or cable and it can also be used with a standard laptop. We also have itraining, Irizar’s online training and vehicle repair platform. This platform is intended for Irizar dealers and distributors and offers the possibility of carrying out online tests and training, along with the option to make contact with other dealers via forums. The iPanel fleet manager offers the most advanced technology to provide customizable solutions according to the needs of the business model. 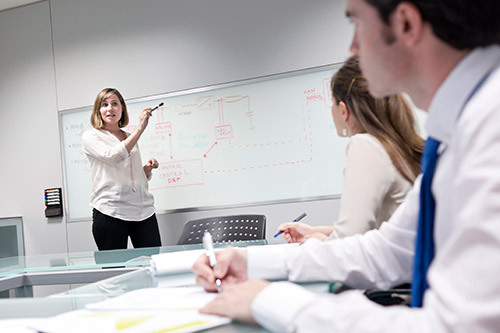 iPanel services are tailored to be integrated into the processes of our clients, helping in decision-making in order to improve profitability. Thanks to our fully customizable fleet management system, our customers can optimize the performance and profitability of their fleet, in addition to thoroughly monitoring costs and efficiency. Datik products and services are designed for commercial fleets of all sizes. The EcoAssist system is a fuel-saving solution that shows the driver a series of instructions that optimize his or her driving style. 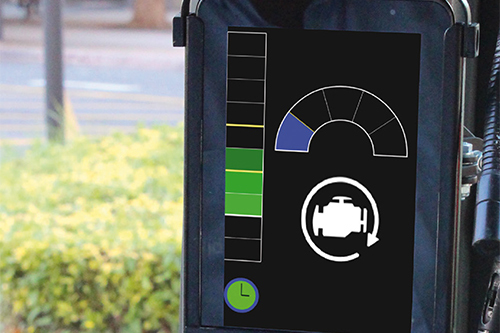 It provides efficiency data on fuel consumption and carbon dioxide emissions directly from the vehicle in order to assist in decision-making and optimizing resources. Design, which became an icon of the brand, is one of the main features that identifies Irizar. Every coach is the sum of the multiple technological solutions and close attention to aesthetics that arise from the experience and innovativeness of the company. 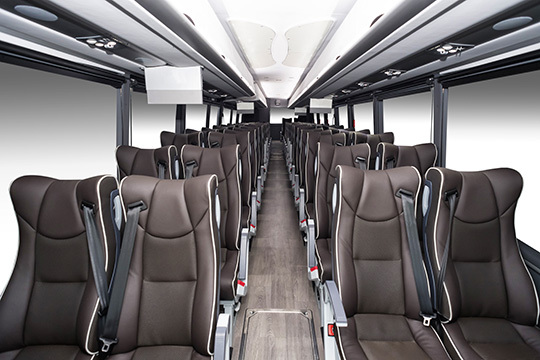 Presence, attractive graphics, aerodynamic lines, solid forms, robustness, ergonomics, accessibility, fluidity and movement are some of the characteristics that our buses and coaches project to the world. The identity and character of the brand glides over the surface of the coaches. Design, technology and sustainability are the expressions of the renewed spirit that pervades the brand and which seeks to inspire confidence in owners, drivers and passengers, who make up the organic part of the coach. Our goal is to create a feeling of well-being and leave passengers with an unforgettable memory at the end of their trip. and you will see how every point in the interior accentuates the sensations created by the sculptural exterior design. Personalization and flexibility to meet the demands of our customers is a key factor that sets Irizar apart. We provide unsurpassed adaptability, enabling customers to configure the coach and other equipment options however they like to suit their needs. Customers may choose from a wide variety of finishes and upholstery for the seats, as well as a long list of options for on-board entertainment, including WiFi, iPod connections, monitors built into the seats, individual sound, navigation and surveillance systems or various catering options. One option is the alternative VIP 2+1 seating layout that is designed for exclusive services and offers great luxury and high quality to passengers. Ideal for regular “first class” lines, it can be easily transformed into a standard layout coach with two seats on each side and adapted equipment and accessibility systems for people with reduced mobility.